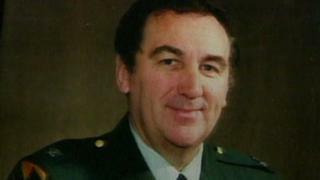 Rick Rescorla, from Cornwall, was head of security for Morgan Stanley, a bank based in the south tower. Mr Rescorla's widow Susan attended the ceremony along with friends and family who live in the US and Cornwall. She said: "Rick was so proud of his Cornish roots. "To know Rick is being honoured in this way and is remembered with such fondness is great comfort. I know he would be so proud of this." Mark Hopwood, managing director at Great Western Railway (GWR) said: "Rick's story is a remarkable tale of incredible bravery and it is little wonder that the public want to recognise him as someone who really epitomises the spirit of the region we serve. "Naming trains has been a part of the GWR since the days of Brunel and we are humbled that Rick Rescorla's name will be carried by one of our new Intercity Express Trains." "I saw Rick numerous times when he came to our floor and spoke to us. All his teachings and all his drills really made an impact. "Some people didn't like being interrupted in business hours but I'm so glad that he did it. To teach us what needed to be done because it [the death toll] could have been so much worse. "We heard on the intercom 'please go back upstairs - we are going to figure out what is going on' and unfortunately some people did listen to that. We learned from Rick and his team to just continue to go down whatever the case may be. "How he helped people that day in getting them out. A true hero. A true hero."